Papa John's: We Want Vegan Cheese, Please! Papa John's is perhaps one of the world's best-known pizza chains, and yet in the UK they do not currently offer a vegan cheese alternative. In recent times, the number of people adopting a plant-based, vegan diet or choosing to reduce their animal product consumption has skyrocketed. According to a study by Ipsos MORI, there are now more than 500,000 vegans in the UK. In addition, around 22 million people are thought to be reducetarians – in that they are actively reducing their animal product intake. Pizza without cheese is just not the same. Therefore, we urge Papa John's to introduce a vegan cheese alternative. Huge news! 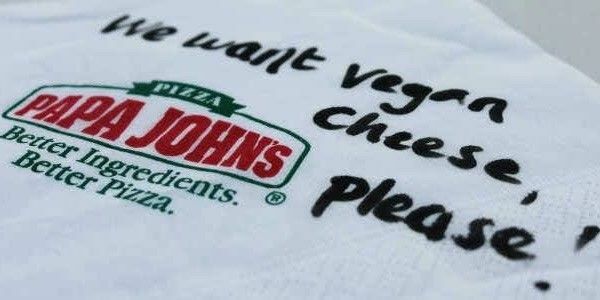 Papa John’s Pizza have confirmed that they are in the process of introducing vegan cheese to stores nationwide. This is fantastic news! Thank you to everyone who signed and shared the petition. More vegan options on the high street at places like Papa John’s makes veganism more mainstream, and therefore more accessible to people – which means more people will eat vegan food! Thank you! Please continue to share! Thank you all so much for signing and sharing this petition - we have smashed our target. Papa John's have been in touch and said: "We are reviewing options that would answer the needs of vegans to our menu. Thus far, we have not found a vegan friendly cheese that meets our quality and operational requirements. We will continue the search in hopes of finding a feasible solution." Please continue to sign and share to encourage them to commit to offering vegan cheese. Thank you so much to everybody who has signed the petition; we are hoping to hit 10,000 signatures by the end of the month so please share with anybody who you think may be interested in signing.